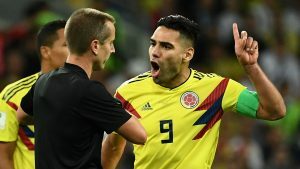 In the match, 23 of the 36 fouls in the match were whistled against Colombia, and six of eight yellow cards Geiger handed out were given to players from the South American squad, in what was a contentious match at Moscow’s Spartak Stadium. Carlos Sanchez was assessed a penalty by Geiger, which led to the only goal of the match, during open play, for England. Falcao added that he found it odd that an American referee was chosen for the match between Colombia and England. Falcao, who plays for Monaco, said the process of referee selections leaves doubts in your mind. He only spoke in English, said the Colombian and there was some bias. Colombia was close to England in time of possession as well as total shots, and was able to register two more shots on target than England prior to the match ending in penalties where they lost 4-3. Falcao insisted that Geiger always called 50-50 plays in favor of England and did not have the same criteria for both squads. The Colombia said it was shameful something like that happened during the World Cup round of 16. This is not the first time accusations have been made against Geiger for improper behavior on the pitch in this World Cup. FIFA and people close to Geiger denied accusations made by Nordin Amrabat of Morocco that Geiger asked for the shirt of a Portugal player during the 1-0 loss by the North African nation to the Portuguese. The performance of the 43-year old referee in the match was also criticized by Morocco. The match was Geiger’s first on the field assignment at this year’s World Cup, and Amrabat, a midfielder, brought up the possibility of bias by the American referee during an interview following the match. The match on Tuesday was Geiger’s third in which he was in charge. He also called the 2-0 South Korea win over Germany during the group stage. In 2014, Geiger was the first American to referee a knockout stage match in the World Cup. He worked France’s 2-0 victory over Nigeria in the round of 16 in Brazil. Geiger also refereed the opening match for Colombia in the 2014 World Cup in which the South Americans won 3-0 over Greece.